Or how about; “Have you ever thought about buying a snow-blower?” We share a driveway. My driveway is a right-of-way through theirs. Oh yes, of all the many needed renovations I would love to do if I had a the money, a flagstone walk-way might be #20 on the list, or lower. Come and see my collection of old lamps I was going to re-furbish. The skeletons of lamp shades I was going to paper mache. The boxes of lamp parts I collected and mail ordered. At least I can make a tour around the house of the fabulous lamps I made. Come and see the cured gourds I have for gourd craft. They are in baskets and nets hanging in my storage room. Lots and lots of gourds. 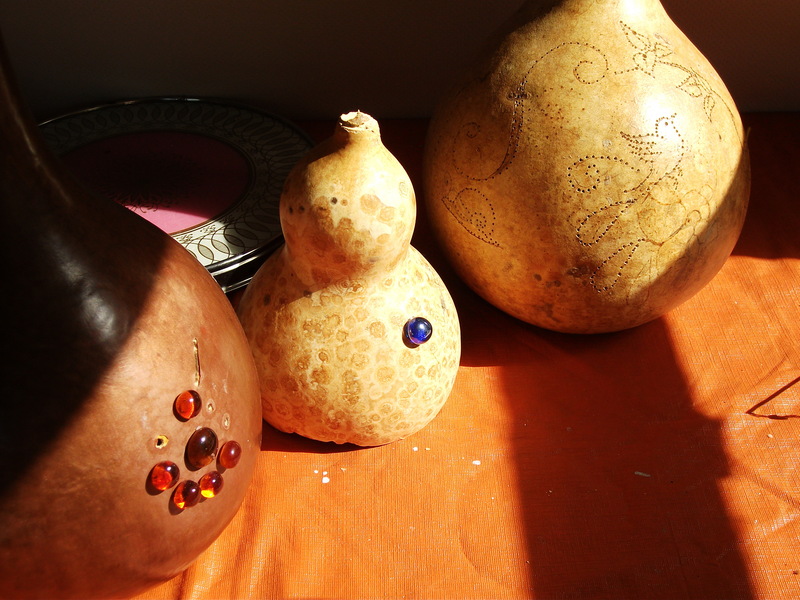 There are some half-finished gourd projects around. I could see after a year or so there was no money in making lamps if I couldn’t make one quickly. Or even sell one for that matter. It would have to be a work of art to get enough money. Then I hit upon idea of making aprons. Would you like to see my giant pile of fabric I still have from that venture? I found it would be impossible to make enough aprons, and sell them to pay bills. Finding fabric nice enough to sell cheap was hard. If it was cheap, it was ugly. I would have to be at my sewing machine 10 hours a day but then I still had to sell that many which I couldn’t because they would cost more than anyone wanted to pay. How about the spring rolls? Salad in a rice paper wrap. Would you like some napkins, little plastic bags or little dip containers with lids? I have a large carton of each in storage. Making spring rolls is lots and lots of work and what doesn’t sell is garbage. Barely enough profit to make the work worthwhile. Not only that, this is chip wagon country, they don’t want no damn salads. So, young man, that is why I’m off to Sobeys today for a seven hour shift. Because I can work there and be assured my bills are paid. I work a lot in the summer and save as much money as I can for my cut-back hours in the winter. It works. And I get worry-free days off. Next year, when I retire, I can get back to my crafts…… at my leisure.